Way now open for Japan's "super HEL"
Component transport | Way now open for Japan's "super HEL"
The largest machine components and plant systems delivered to ITER by the seven Members fit into two main logistics categories¹—Conventional Exceptional Loads (CEL), delivered along regular roads, and Highly Exceptional Loads (HEL), which must travel along the dedicated ITER Itinerary. Within this last category one sub-group stands out—the "super HEL," comprising 30 of the largest, heaviest and most awesome ITER components. Signed on 7 March in Naka, the implementation agreement opens the way to the delivery of all the super-HEL components procured by the Japanese Domestic Agency. Pictured here: Daisuke Hayashi, General Manager, Heavy Cargo, Transport and Engineering, Hitachi Transport Systems; François Genevey, ITER Transport Project Director at DAHER; and Kenichi Kurihara, Director-General, Naka Fusion Institute. Anything heavier than 60 tonnes—or with dimensions exceeding 5 metres in height and/or width—is considered an HEL and must travel the route that was specially adapted for ITER components. Out of an estimated 300 HEL planned, 70 have already reached ITER. The most impressive loads, however, are yet to come. Toroidal field coil #12, scheduled to dock at the Marseille-Fos harbour late this year, will be among the first "super HEL" to be delivered to ITER.² The D-shaped magnet, 18.5 metres in height and weighing more than 500 tonnes, is nearing completion under the supervision of the Japanese Domestic Agency QST at Mitsubishi Heavy Industry's Futami facility. Transporting such a massive and valuable component halfway around the world requires not only a lot of technical preparation, but also a precise regulatory framework. 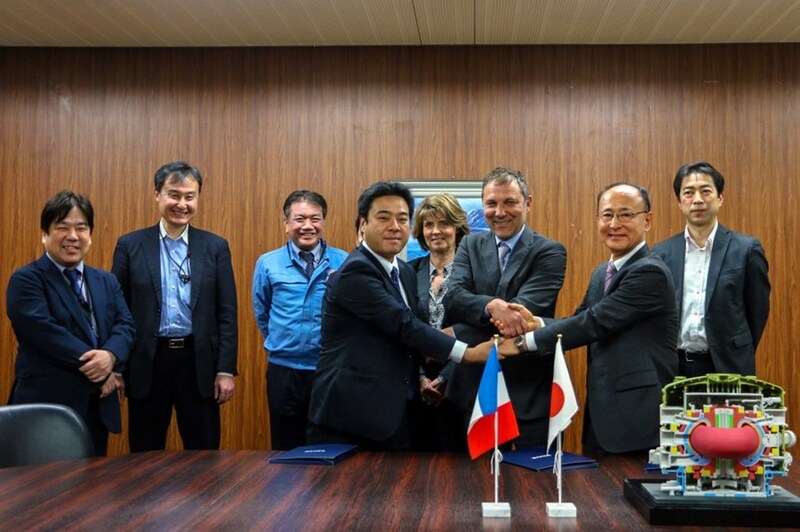 On 7 March, ITER global logistics provider DAHER, its local partner Hitachi Transportation System, and QST signed the implementation agreement that opens the way to the delivery of all the super-HEL components procured by the Japanese Domestic Agency. "The transport and delivery of this first toroidal field coil opens a new chapter in our collaboration with ITER," says François Genevey, the ITER Transport Project Director at DAHER. Like all the other super-HEL components expected to be delivered—the other 18 toroidal field coils³, the 2 poloidal field coils manufactured off site, and 9 vacuum vessel sectors—toroidal field coil #12 will travel in a highly sophisticated transport frame that is currently under design at Mitsubishi Heavy Industry and Toshiba. The structure will be equipped with protective elements (dense polymer pads, acceleration absorbers) to mitigate the effect of movement or acceleration and to diffuse the stresses that will inevitably occur during the long sea voyage and transshipment operations. ¹ About 10,000 components fall into the category of "Conventional Loads," 3,000 are "Conventional Exceptional Loads" and 300 are "Highly Exceptional Loads." ² Poloidal field coil #6, manufactured in China under a European contract, and toroidal field coil #9 procured by Europe are the other "super HEL" scheduled for delivery before the end of the year. ³ 18 toroidal field coils are needed for the machine, plus one spare.